Rideau Raildek, established in 2002 is the decking division of Colonial Roofing and Contracting Inc., commercial and flat roofing specialists for over 10 years. Owner Mike Johnson has an engineering background with 20 years of contracting experience. This experience, in addition to the Duradek training program, enables him to understand not only the decking and waterproofing aspect of a project, but the entire scope of work, from top to bottom. Rideau Raildek with their team of experienced installers is committed to integrity and quality in every project, from planning to completion. The Duradek Authorized Contractor receives training which is a combination of floor laying skills for appearance and single-ply roofing skills for water tightness. Thorough knowledge of adhesives, sealants, coatings, carpentry and concrete restoration work are common traits of a Duradek contractor. 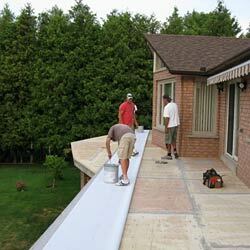 All Duradek products, when applied by an authorized Duradek contractor, are covered by written warranties. Do It Yourself ? NO! Duradek is applied ONLY through a network of trained installers so we know the job is done right, the first time. We understand proper waterproofing details, building codes and know how important your investment is. Trust your job to the trained professional network of Duradek applicators!